No keeper for me since Saturday. On Sunday, however, I did get 8 short stripers in a split session (630am to 830am; 3pm to 5pm). I even caught a fluke and also a dog fish–aka sand shark–which I got on a double header with a 10-inch striper! Biggest fish I had was 22 inches. 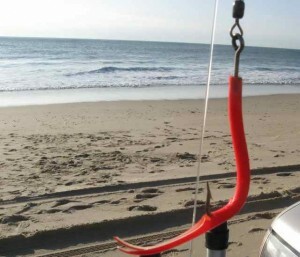 The fish were taken at Truck Beach/Napeague State Park—the scene of Saturday’s “keeper” crime, if you will—and west of White Sands. Virtually all, except the micro-bass, hit the red tube teaser. At daybreak, small fish were porpoising right out of the water and there were swirls in the wash. A few birds worked over the gentle surf. It didn’t last long. Some quality fish came up both in the morning and in the afternoon on Truck Beach and near Napeague Lane. But Sam Doughty, who had 20 bass for the day, said not one of his was a keeper. Overall, however, the fishing was stupid good the entire weekend from Georgica Beach to Hither Hills with the epicenter being Amagansett. No showly blitzes. Sometimes a few birds working in the early hours. Mostly, however, sharpshooting wherever a patch of water looked fishy or the structure showed a cut in the bar. Bucktailers will be bucktailers and fish were caught on white and chartreuse. But the deadliest lure was the A27 diamond jig with a green tube–esssentially serving as a TDD (teaser delivery device). Teaser tubes, I learned, made all the difference. The fish were sometimes right in the wash and mostly just in back of the breakers in the trough beyond the sandbar. S-l-o-o-w retrieves worked best with an occasional jerk of the lure off the bottom. The sand eels invasion continued unabated. Sunday morning the beach at Napeague was littered with them and it was very common to snag one or two on a retrieve along the bottom. Monday morning the weather turned. Overcast skies, a forecast of showers and winds out of the northeast. At first light, I made a last pre-Thanksgiving run on the beach. Gannets dove big time near White Sands. They moved in fairly close—to the outer bar—but not close enough. I picked up one 12-inch striper at Napeague before quitting at 9am. Then it was up-island to reality, a birthday dinner with Tono and Le Nozzi di Figaro at the Met. Worse days, I have had. Monday’s lightening round might have been my season ender (Tick tock!). Future fish calls and the weather will determine that. In any case, I didn’t plan to return until after the holiday. So the question was, would the Fat Lady sing while I wolfed down Turkey and cranberry sauce? This entry was posted on Tuesday, November 24th, 2009 at 11:51 am and is filed under Uncategorized. You can follow any responses to this entry through the RSS 2.0 feed. You can leave a response, or trackback from your own site. Delicious point. 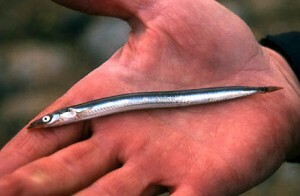 Sand eels are pure protein. Healthy because they are low on the food chain. Unlike “capitone”, the Neopolitan eels typically roasted or fried for the holidays, these little guys are best eaten like alici: marinated in some silky olive oil perfumed with garlic and limone!